“Down the street, restaurateur Chris Johnson has reopened his diner after a 10-day shutdown. His customers are slowly coming back, and the presence of those who lost their homes is particularly noticeable Friday nights. Local singer Denise Roggio’s “Yarnell Rising,” which Mr. Johnson describes as a heartfelt song of hope, is a big draw. Families of the Granite Mountain Hotshots who died fighting the Yarnell Hill wildfire will benefit from an all-day fundraiser Saturday at the Veterans of Foreign Wars Post No. 541 in Prescott. Doors open at 10 a.m. and stay open until 7 or 8 p.m.
Yarnell resident and musician Denise Roggio, who wrote “Blazing Honor” in tribute to the Hotshots, will debut her newest song, “Yarnell Rising,” during her performance that will close the event. 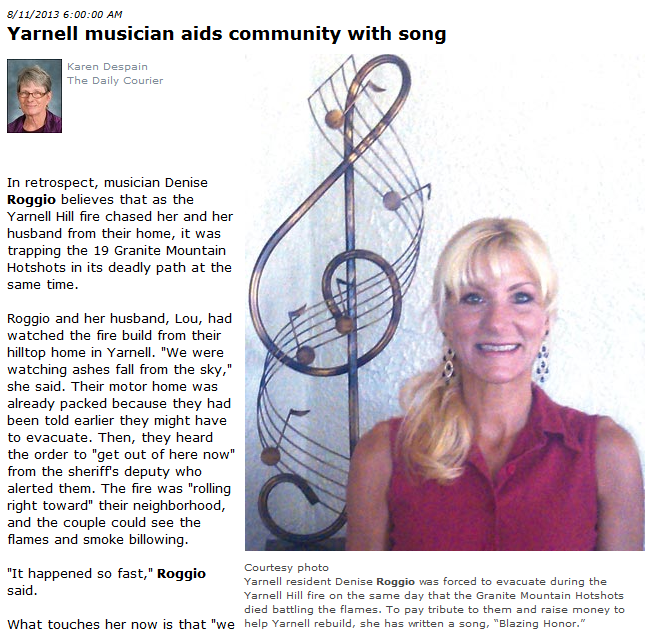 The community of Yarnell lost scores of structures during the fire, and Roggio’s new song – an upbeat country rock melody – is meant to inspire residents, she said. “We are rising from the ashes. Wildfires can’t drag us away. We are bruised but we’re not broken. Home sweet home is where we want to be.